Serve these little mouthfuls hot or cold. In small saucepan saute mushrooms and onions in margarine until onions start to caramelize. Add spice, cayenne pepper and garlic powder. Stir in the flour and mix well. Add the water and cook until thickened. Remove from heat and add the lemon juice and red pepper. Taste and adjust for salt and pepper. Set aside to cool while making the pastry. In medium sized bowl mix flour with salt, garlic powder, baking powder. Rub in margarine until the mixture is crumbly. Mix in water and make a soft dough. Do not over mix. Gather dough in a ball and wrap in plastic and chill in refrigerator at least one hour. Remove dough from refrigerator and roll on floured surface into about a 9 x13-inch rectangle. Spread the dough with the 2 tablespoons margarine. Starting at short end fold one third of the dough towards the middle and then fold the other side of dough over that. You should now have a small rectangle of dough. Re-roll into the original 9x13-inch size. 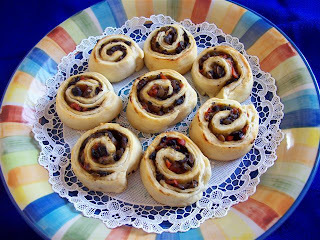 Spread cooled filling over the surface of the pastry and starting at long side roll up in a jelly roll fashion. Cut into slices and place on greased or parchment lined baking sheet. Bake in 375 F. degree oven for 12-15 minutes or until golden. Server hot or cold. Makes 12-15 pinwheels. This is great recipe. At last I found something new to make. Thank you for sharing. I really enjoyed the Mushroom Pinwheel Hors d'oeuvres. Mushroom Pizza Crazies w/ Pumpkin Sauce!